The Round Lake Area Exchange Club Hometown Hero Committee is honored to announce the February Hero; U.S. Marine Lance Corporal Nicholas A. Rahn, a resident of Fox Lake. This month’s sponsor is Vogue Printers of Waukegan. 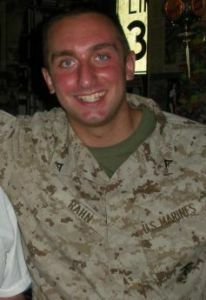 Nicholas was registered at the Clubs site, www.rlaexchange.org/hero, by his parents Steve & Jean Rahn also from Fox Lake. Jean had read about the Clubs Americanism Project in a local newspaper. Nicholas is currently serving in Afghanistan and has been there since September of last year. He is a 2008 Grant Community High School graduate that decided to follow his father’s footsteps when he enlisted in the Marines in May of 2009. Sherry Ridge, the Hometown Hero Project Chair, shared, “In his short time in Afghanistan he has lost over 20 fellow Marines from his unit, his mother feels that getting his ‘Hanging with the Heroes’ care package will do a lot to lift his spirits.” Nicholas is the only child or the Rahn’s and they are extremely proud of his choice to serve in the Marines. Ridge will be filling his “Hanging with the Heroes” care packages with beef jerky, crackers, trail mix, cookies and chocolate as well as a personalized “Hanging with the Heroes” shirts and letters from Round Lake Area School District 116 students. The Club will present the Rahn family with a plaque on behalf of the February Hometown Hero at their February 9, meeting. The meeting is held at Panera Bread in Round Lake Beach, 7:30 a.m.